The entry form for the TGA Consulting Engineers Bridges Of The Tyne 5 Mile Road Race 2015 will open at 6:00 am on Saturday 28th February 2015. It’s now only one week to the third running of the Race Day Bridges of the Tyne 5 Mile Road Race. Thank you for entering this year’s race, the demand for places was unprecedented, with the 400 places available sold out in just over 30 hours. We have now closed the race for transfers. The current start list for this years race has been updated to reflect recent athlete withdrawals, reserve list additions & athlete club changes. ‘The Bridges’ race received a huge boost on Monday 16th June. Following the announcement of her Commonwealth Games Marathon team selection Aly Dixon, from Sunderland Strollers, has confirmed to Tyne Bridge Harriers that she is using the race as part of her preparations for the Marathon in Glasgow on 27th July. 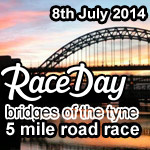 Here is the current start list for this years Race Day Bridges Of The Tyne 5M Road Race 2014. 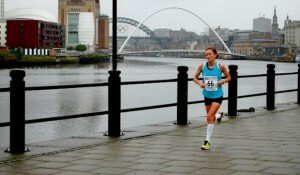 The second running of Tyne Bridge Harriers Bridges of the Tyne 5 mile race takes place on Tuesday 9th July at 19:15. Following the success of last years race we increased the number of places available by 100 and entries for the event still sold out within four weeks . 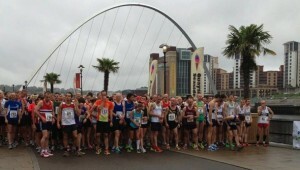 The current starting list for the Tyne Bridge Harriers : Bridges Of The Tyne 5 Mile Road Race 2013 has been updated. With only 39 places left in this years race, if you haven’t already entered, now is the time to act quickly to avoid last minute disappointment. Bridges Of The Tyne 5 Mile Road Race 2013 – ONLY 70 places left !! Since the announcement of our 2nd Bridges Of The Tyne 5 Mile Road Race only two & half weeks ago, and as predicted, it’s selling out fast. We have reached 330 entries so far meaning that there are only 70 places left in this years race !! Bridges Of The Tyne 5 Mile Road Race 2013 – ONLY 120 places left !! 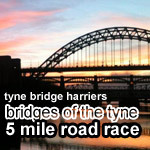 The current starting list for the Tyne Bridge Harriers : Bridges Of The Tyne 5 Mile Road Race 2013 has been updated. With only 120 places left in this years race, now is the time to act quickly to avoid last minute disappointment if you haven’t already entered. In just over a week of its announcement, The Bridges Of The Tyne 5 Mile Road Race 2013 has accepted over 200 runners to the starting list. The race will reach maximum capacity very soon, so if you haven’t yet entered, now is the time to do so. Tyne Bridge Harriers are proud to be staging the 2nd Bridges of The Tyne race on the evening of the 9th July 2013. Starting on the historic Quayside opposite the Wesley Memorial at 7:15pm, the event offers spectacular views down the Tyne.